Your itinerary includes some good beach time at Kitsilano Beach and English Bay Beach. Escape the urban bustle at Granville Island and Vancouver Seawall. There's lots more to do: admire the natural beauty at VanDusen Botanical Garden, take a stroll through Gastown, stroll around Stanley Park, and kick back and relax at Spanish Banks. For where to stay, traveler tips, ratings, and tourist information, read Vancouver day trip planning app . If you are flying in from Canada, the closest major airports are Vancouver International Airport and Victoria International Airport. In April, daytime highs in Vancouver are 16°C, while nighttime lows are 8°C. Cap off your sightseeing on the 26th (Fri) early enough to travel to Cascade Locks. Cascade Locks is a city in Hood River County, Oregon, United States. On the 27th (Sat), look for all kinds of wild species at Starvation Creek Ridge Loop, hike along Oneonta Gorge, and then admire the sheer force of Multnomah Falls. 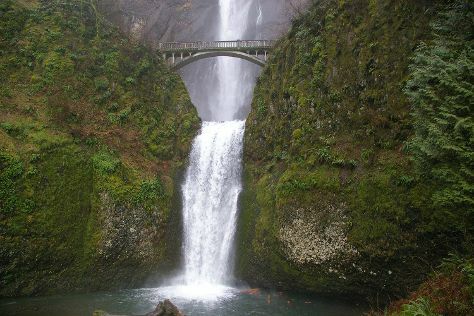 Planning Cascade Locks trip won't be overwheling when you use's Insprock itinerary maker. Explore your travel options from Vancouver to Cascade Locks with the Route module. In April in Cascade Locks, expect temperatures between 17°C during the day and 7°C at night. Wrap up your sightseeing on the 27th (Sat) early enough to travel to Crater Lake National Park. On the 28th (Sun), hike along Annie Creek Canyon, hike along Pinnacles Trail, and then look for all kinds of wild species at Rogue River Gorge Viewpoint. To find maps, where to stay, and more tourist information, use the Crater Lake National Park itinerary builder website . Explore your travel options from Cascade Locks to Crater Lake National Park with the Route module. Traveling from Cascade Locks in April, expect nights in Crater Lake National Park to be about the same, around 6°C, while days are somewhat warmer, around 22°C. Wrap up your sightseeing on the 28th (Sun) early enough to travel back home.